Imagine prepping your local community garden for springtime planting and coming across the bones of an adolescent Camarasaurus! Help us dig up this life-size dinosaur puzzle and put the pieces together. Join us from 10:30-11:30 in the Community Garden sandbox! From 11:30-12:30 in the Commons Theater, enjoy a “Storybook Movie Time” showing of the Nick Jr. show Dino Dan! The first six visitors to become a BCM member will go home with their own Dino Dan DVD. Make your own Mesozoic mini-monster puppet! Introduce your prehistoric pal to one of the baby dinosaurs starring in ERTH’S DINOSAUR ZOO at The New Victory Theater. They’ll be roaming the Beach Area from 12:00-2:30. Check out some of the most amazing fossils from our collection. We’ve got everything from a woolly mammoth molar to an oreodont skull to real dinosaur footprints! We’ll be making observations at the Touch Tank from 12:00-12:30. Visit us in the upstairs classroom for “Excavation Station” at 1:30. We’ve been creating special plaster dig sites so students can play paleontologist as they unearth real bones, shells, and other treasures. 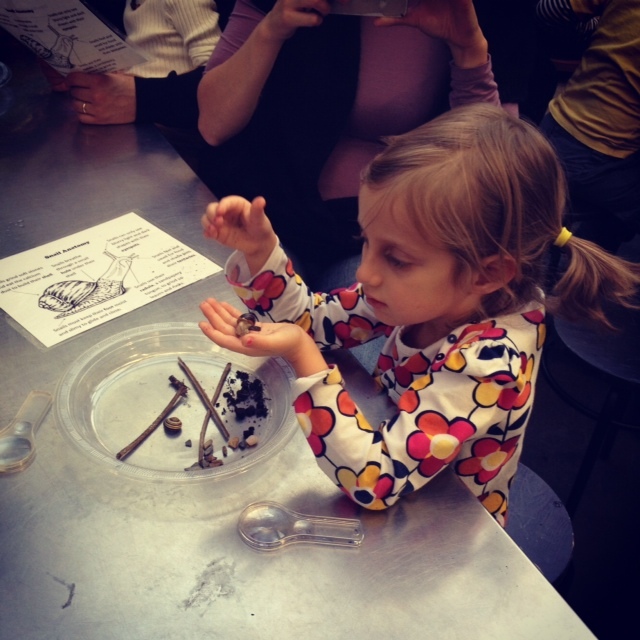 Bring your “Petite Paleontologist” to Totally Tots at 2:30. They’ll explore real fossils and create their own clay craft to take home! End the day with our “Dino Trivia” extravaganza at 4:00 in the Commons Theater! Meet the animals of BCM that have connections to the prehistoric past, use real collection objects to uncover clues, and test your dino expertise! As a science educator, I hope to create more eco-literate students . We want them ready to stir up creative solutions to the many challenges we face on this warming planet. From the threat of rising sea levels to higher rates of asthma, New York City children are at the center of many environmental problems. But how can you get first graders to understand something as big and complex as climate change without having mini meltdowns? A few weeks ago, I dubiously set out to have a conversation about climate change with our six year old after-school kids. Despite my fears of blank stares or horrified reactions, the conversation went extremely well! Here are some lessons I came away with. Personal connections. In the week prior to this climate change talk, Hurricane Sandy passed through New York. The storm caused a huge amount of flooding and damage to Far Rockaway, Coney Island, Red Hook, and Lower Manhattan. Luckily, only a few of our staff and Kid’s Crew kids were directly affected by the flooding, but all of us felt impacted in some way. Our kids all had stories of how they spent the hours of the storm. One girl described the howling wind outside her window, “I could hear the wind…it was really scary!” Another kid mentioned that he lives near the water and described seeing lots of dead fish on the beach afterwards. We talked about where the water comes from when it floods. I asked them what the water would taste like if they stuck their finger in the Hudson River or Rockaway Beach. “It would be salty!” they shouted. We learned how scary floods can happen when a storm makes the ocean water surge onto land where people live. I explained that something is happening on our planet that makes really strong storms occur more often — climate change. Start your conversation by asking your students if they’ve ever experienced a strong storm, flood, or power outage. These visceral memories help kids connect to the concepts. Kids should understand that climate change isn’t something that’s coming in the far distant future. It’s happening now and we’re already feeling it’s effects. Use a kid-friendly book. This is where I turned to the really great Scholastic book Climate Change for help. It puts a scary phenomenon in kid-friendly terms. I asked them if they remembered the animal on the cover of the book. Of course! It’s the mighty polar bear we learned about last week! This book sums up the climate crisis in 40 picture-heavy pages. It even has a picture of a hurricane that looks an awful lot like Sandy. Get yourself a climate change icon. We had just studied polar bears the week before Sandy so the kids were already invested in the well-being of these gigantic creatures. We did a little review of what they remembered: Polar Bears live in ice dens, they’re good swimmers, and they hunt for seals. Play a game. Kids can only take in so much information before they need to get up and moving. After all that talk, it was time to transform into polar bears and go on a hunt for seals. They lined up behind me and I pointed to an “iceberg” on the other side of the roof (hula hoops would make great “icebergs”). We got our strong swimming paws and legs ready and started paddling to the iceberg. When we got there, we feasted on some delicious seals. I explained that summer had arrived and we’d eaten all the seals on this iceberg. “The next iceberg is waaaaayyyy over there! Will we make it? !” We started swimming. This time when were about halfway across the roof and I narrated: “Oh no, we’re so hungry, we’re getting sooo tired, we’re not going to make it!” I had a couple kids feign dramatic polar bear deaths (a favorite natural sciences pantomime) and sink to the bottom of the icy sea! We traveled to a few more icebergs until our polar bear numbers had sufficiently dwindled. Emphasize that we all share the same planet. Whenever we talk about an animal threatened by an environmental disaster, it’s important to remind the kids that we’re animals too and we all share the same planet and resources! I explained that we’ve lost a lot of polar bears over the past 30 years due to the ice melt. And where does that water go when it melts? Back into the ocean – uh oh, we know from Hurricane Sandy that it is not in our best interest to have higher sea levels! A safer planet for polar bears is a safer planet for us. Six-year-olds get it…why can’t everybody? Every Wednesday, I teach a science lesson to our 1st grade after-school kids. So far this year, we’ve explored snails, stick bugs, camouflage, and games from around the world. A couple weeks ago, we learned all about polar bears! Polar bears are the largest land dwelling carnivores. They prey almost exclusively on seals. Surprisingly, when food is plentiful, they’ll only eat the seal’s fatty tissue- found in their brains and blubber- before moving on to the next kill. They are fully stocked with ice-hunting adaptations to make them fierce predators. Their paws have ice-pick claws that never retract and non-slip foot pads covered in tiny bumps that create suction on the ice. Their noses’ have a huge olfactory bulb that can smell a seal in water from a mile away. Polar Bears are so well insulated that they often have to take dips in the icy water to cool down – they can swim for miles in Arctic water without stopping. Get this – each individual hair on a polar bear is a clear hollow tube. The hair funnels sunlight down to the bear’s black skin where the heat is absorbed and retained under a layer of blubber! 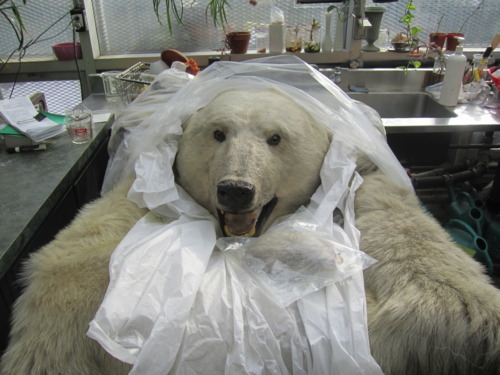 We will be getting out our incredible Polar Bear skin specimen on December 30th for a “Blubber Up!” program all about Arctic animal adaptations. Though I’m glad the importation of Polar Bear hides has been banned in the US (decades after we acquired this specimen), seeing a hide in person is truly awe inspiring. Don’t miss the chance to examine their transparent tube hairs up close! The after school kids used their new expertise to sculpt a polar bear out of model magic clay. It was interesting to see the kids flattening out their clay before beginning to shape it into a bear likeness. I realized that many of them hadn’t sculpted before, and since we had only been looking at pictures of polar bears, they had trouble conceptualizing a 3-D bear! We talked about molding a special long neck, strong swimming legs, and had to refer back to some pictures to remember if polar bears have tails or not. They were given a black marker to fill in the eyes, nose, and foot pads. Since we just had our first snowfall, the kids were able to go outside and collect snow to build real ice dens for their bears! Each kid scooped up a bowlful of snow and shaped the snow to fit a mama bear and one or two cubs. By the end of the class, the dens were melting which was a perfect setup for next week’s topic: Climate change! Stay tuned to hear about how six year old scientists talk about climate change. Snails make the perfect classroom pets. They aren’t terribly high maintenance but they require enough care that students get to play an important role in maintaining a healthy colony. A fish tank makes an ideal snail enclosure but those can run a little pricey- a plastic bin with a removable lid makes an inexpensive alternative. It should be at least around 20 cm x 20 cm. The bigger your enclosure, the easier it will be to monitor humidity levels. For more tips on building your own tank, check out this site. 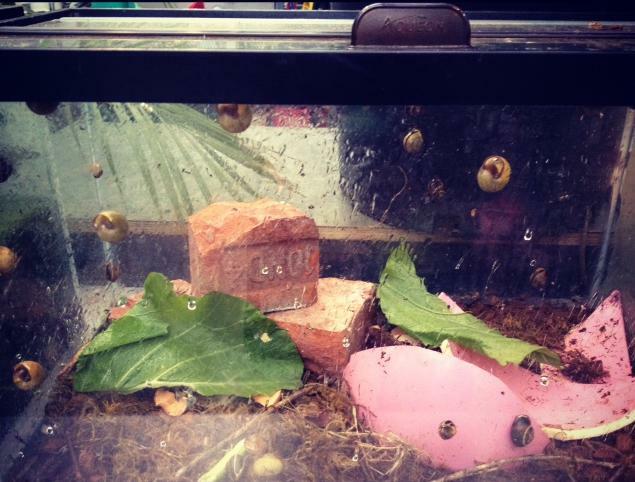 You can build the habitat of your snail enclosure as a class project. Collect dirt, rock, leaves, and sticks. You can even throw in real moss and ferns to help with humidity levels. Bricks, limestone, cement, or old sea shells add a source of calcium that the snails will grind up and use to “build” their shells. Any gardener would be happy to let you collect plant-eating snails from their garden. 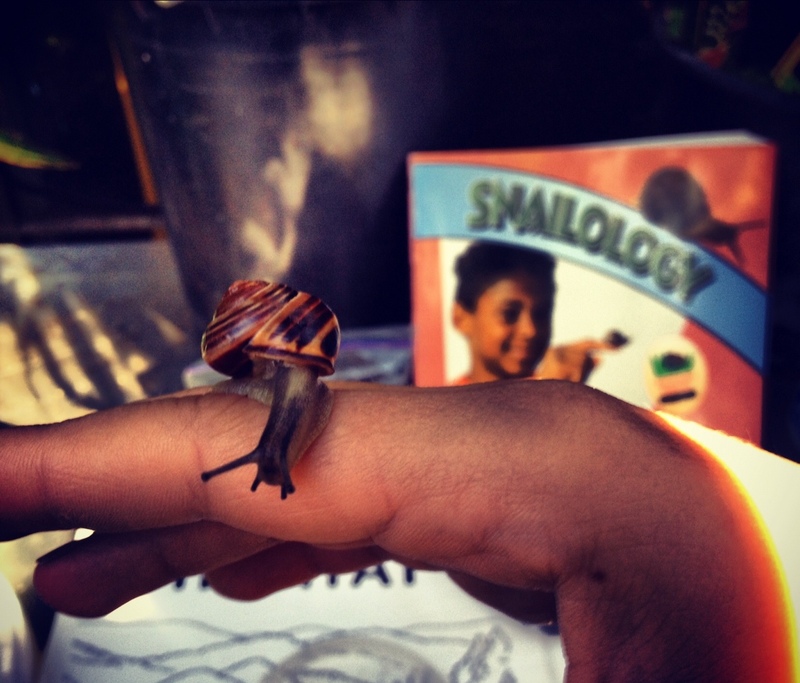 Perhaps your class’s snail collecting could involve visits to local community gardens! Spray down their enclosure. If you don’t keep snails moist with a daily spritz, they’ll seal themselves up in their shell with a film of dried up slime. But don’t water too much — too much moisture and you’ll get stinky mold in the enclosure. Add some fresh lettuce greens to your tank and watch how quickly the snails chomp away. You can try out other fruits and veggies to see what your snails prefer. Build a maze! Can find their way around corners and through obstacles? Snail circus! Build a snail tight rope with some string and watch the snails race across. Do they “walk the line” or prefer a more windy path? Test the weight bearing power of a snail! Tape a string and a penny to their shell. Can they pull a penny? Can they pull a quarter? Are snails attracted to darkness or will they seek out the light? Let us know if you have snail success! One of our new school programs this year is called “A Snail’s Place.” This program was born when we discovered that kids don’t just dig snails, they love them. Whenever we bring out one of these plant-devouring gastropods, which we happily collect from our own garden, kids become transfixed in close observation. 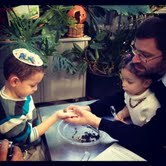 The excitement of a snail emerging from its shell and poking out one tentacle feeler at a time, the tactile sensation of their slimy foot moving across their hand, and the surprisingly quick responses of snails can hold kids’ attention for twenty minutes (that’s like two hours in kid-minutes). Snail observation also escapes the fear factor that comes with observing other bugs like our Madagascar hissing cockroaches. At BCM, we are always working to make our programs less didactic and more inquiry based! Rather than delivering all the interesting snail factoids to passive students, we want our students to feel empowered to do their own research and share their findings. We composed a snail resource sheet for the kids to explore. 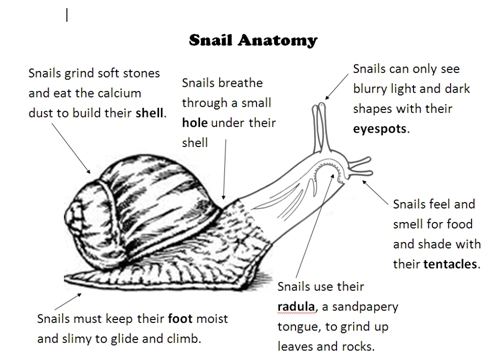 The students can read and share the facts they find most interesting and compare their live snails to the anatomical diagram. Can they find their eye spots? Can they find their spiral shell? Can they find their breathing hole? We collect scientific observations and questions as the students observe. Some questions we’ve collected from the public include: Are snails good climbers? How do you think they move? What’s the purpose of that slime? Why do they come out in the rain? What kind of habitat do you think they like? Our final activity is to review the things that snails need in their environment to be happy. 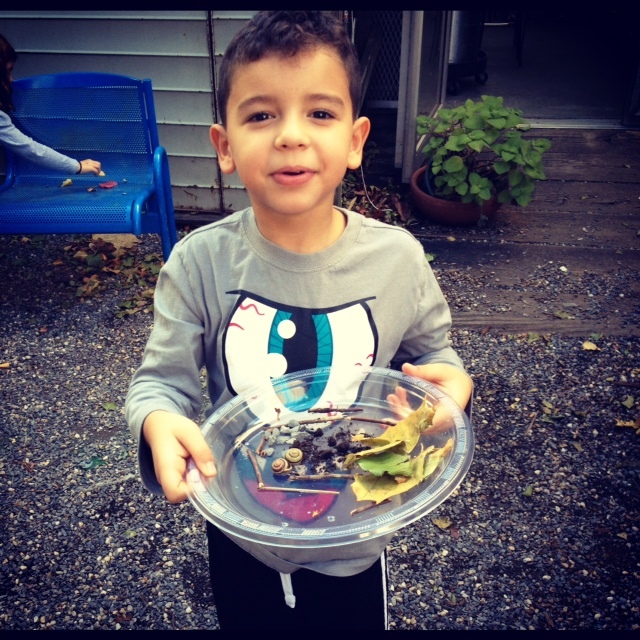 The kids venture outside to collect sticks, rocks and leaves to build the perfect snail habitat! They observe how the snails interact with their new environment. Do they seek out the shade or the light? Do they like to eat all kinds of leaves? 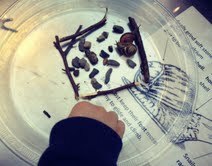 The students add their most successful snail architecture to our permanent snail enclosure. Stay tuned for tips on keeping your own classroom snail tank! 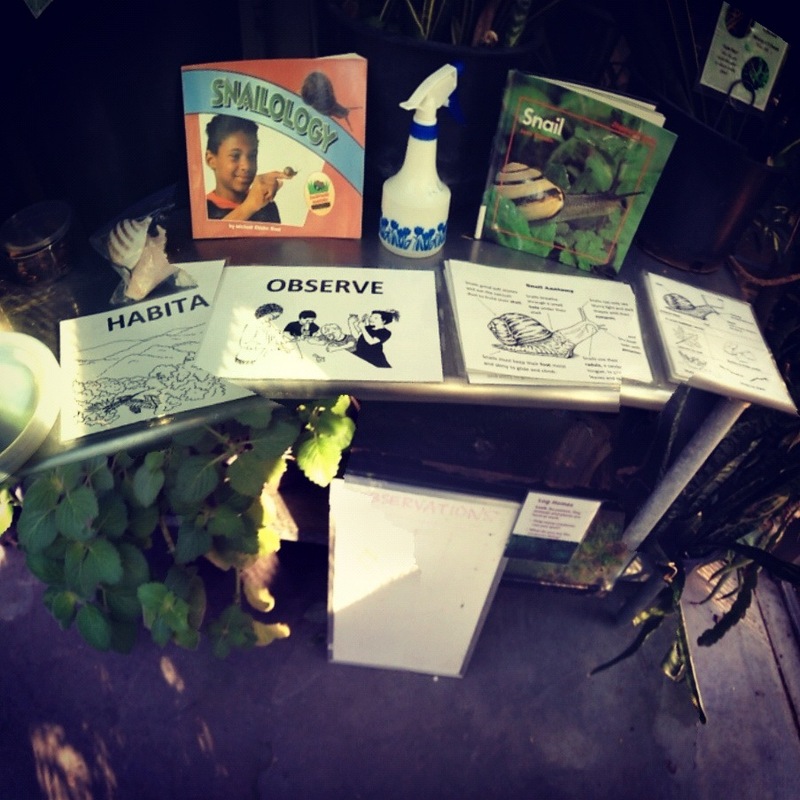 There is definitely no shortage of resources for starting your own school garden in NYC! We’ve covered how you can DIY with GrowNYC’s Grow to Learn program, start a school garden on a fence with the Wooly School garden program, or even pursue becoming an Edible Schoolyard NYC garden site. But if you really want to talk to the experts and get comfortable with the basics, NYBG is hosting another School Gardening workshop on election day- November 8th. Register soon before spaces fill up! 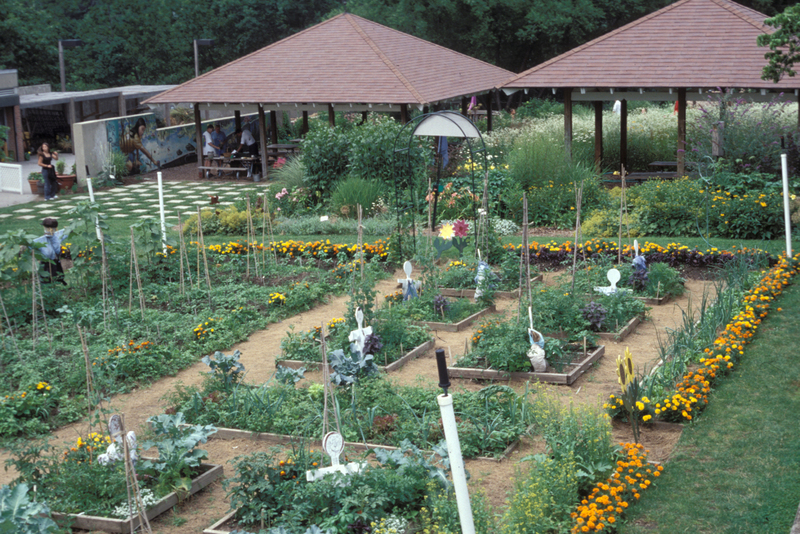 Come learn about the benefits of having a garden on your school site. Join NYBG staff and other gardening organizations to learn about logistics, resources, and curriculum connections for creating, maintaining, and integrating gardens into your students’ learning. This half-day workshop is the perfect primer for helping you begin planning or even rekindling a garden on your school site. For more information, contact Judith Hutton, at 718.817.8140 or jhutton@nybg.org. To register, contact Registration at 718.817.8181 or school_programs@nybg.org. In our Migration Sensation program, we spotlight a vital bird behavior called preening. Have you ever observed a bird rustling their beak into their plumage? They’re retrieving special oils from a gland at the base of their tail and applying it to their feathers. Those oils help to waterproof and protect their feathers. When researching tidbits about grackles for our last post, I came across a strange phenomenon involving preening and ants. Grackles, along with over 250 other bird species, can occasionally be found standing on top of an anthill in a still posture with their wings outstretched. Their aim is to disturb the ants and send them into full home-defense mode. The ants frantically crawl over the bird’s body releasing chemicals like formic acid. These chemicals may supplement the bird’s own preening oils and they serve to ward off other insects as well as fungus and bacteria. 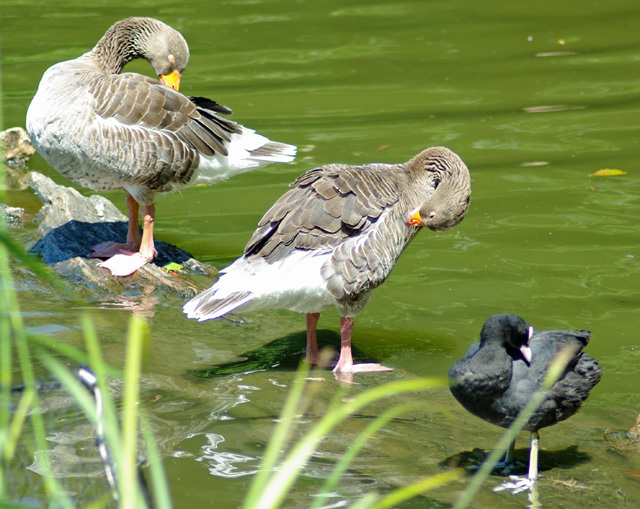 Along with coating their feathers with oils, preening birds are also “zipping” up their feathers. They’re reattaching each tiny hook and barbules on each barb that lines each feather. Take a close up look at these important, yet surprisingly simple, structures. As feathers get ruffled throughout a bird’s busy day, they become less aerodynamic. Each feather is attached to its own muscle and serves to make the bird an intricate flying machine. Humans studied birds when designing the airplane, but the modern airplane pales in comparison to our feathery friends. The airplane has a few flaps and a rudder to create lift and drag while a bird has hundreds of teardrop shaped feathers manipulating the airflow around its body. Each feather must be kept neatly groomed and placed in its prime position for flight.